Roller Service Corporation is a manufacturer of quality printing press rollers. 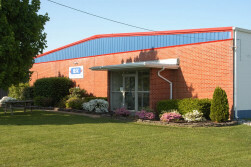 We have been serving printing companies since 1976. Our goal is and has always been to provide a quality product with outstanding service and a commitment to Excellency for our customers. We specialize in hollow cores for Goss Community, Harris M-110, Harris V-15, Goss Magnum and many more presses. These rollers are shipped with or without bearings to your location. To reach us you may call us at (800) 441-7175 or contact us here.